What do you get when you cross soccer and ice hockey? Field hockey. Did you know players can only use one side of their stick and you can’t block the ball with your body? Field hockey is available in the fall for Grade 7 students only. Most boys are new to the sport, so the program starts by teaching basic skills. With no official organized competition, the team plays other independent schools in exhibition games. 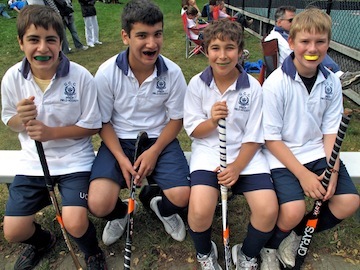 Skills learned help with Upper School sports like hockey, soccer and rugby.